Eye On Sports Media: Dominic Johnson To Carry St. Lucia Flag Friday Night? Dominic Johnson To Carry St. Lucia Flag Friday Night? Athens, GA (Aug 7, 2008) - Dominic Johnson, representing the island nation of St. Lucia for the 3rd time in the Olympic Games, seems to be the likely candidate to carry the flag of St. Lucia in the opening ceremony of the 2008 Olympic Games. I know, you are asking yourself "So what? ", and that response is the exact reason for this article. Well for starters, Dominic (pictured left) is a cousin of she who must be obeyed (SWMBO) and my children. Unfortunately, because in the past we have only been able to see the summer games on NBC Sports, they would invariably go to commercial when the St. Lucia delegation would enter the stadium. As such, Dominic's 60+ cousins, aunts and uncles in the United States could not share in the joy of he and the rest of the team entering the stadium. Yes, NBC Sports has traditionally seemed to forget that there are a lot of people in the United States from other countries, such as St. Lucia, who live for moments like these only to see nothing but a commercial for one of the broadcast sponsors. For SWMBO, a citizen of Saint Lucia, Trinidad & Tobago, and the United States, it is nothing short of disappointing. The solution is simple. Why doesn't NBC Have sponsored segments for the parade of nations in the same manner of soccer broadcasts: throw a sponsored graphic up in the corner and let the parade unfold in real time. Heck, NBC Sports is bragging that they have sold over a billion dollars of ad time, so why not let the little guys have their moment in the sun. 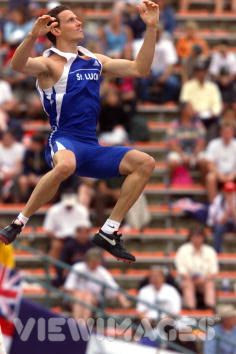 Dominic failed to clear the bar in 1996 and finished 18th in 2000. At the age of 33, this is likely his last Olympic games, and he barely qualified on July 11 in San Diego. But he did qualify, which is better than most of us could ever hope to do. So you read it here first in case NBC Sports misses St. Lucia again tomorrow night. Dominic Johnson, descended from a family that has been in Saint Lucia for over 260 years and is related to Josephine Bonaparte and Franklin Delanor Roosevelt (according to family research and lore), will probably be carrying the flag for his country tomorrow night.